Bubs started Reception at infants school in September and has been learning phonics. It’s all very different to the way that I was taught to read but it’s fascinating to watch it all come together for Bubs. This week she surprised me by recognising the words rat, hat, cat and pat and sounding them out for me. It won’t be long until she’s reading starter books. I have had a lifelong love of reading and I can’t wait to share some of my favourite childhood books with Bubs. I’ve just watched last night’s episode of The Fall. Oh. My. Goodness! It was so good. I won’t spoil it for anyone who hasn’t seen it yet but I was literally gasping in shock at the end scenes. Bubs loves to sing and so do I (although not very well!) and I’ve always sung little rhymes and lullabies to her. Lately she’s been asking me to sing her to sleep like I did when she was a baby. Her favourites are Little Sir Echo and this one by Anna Johnson. I used to sing this to her when she was just a bump and she would kick and wriggle away inside me. I made a pink raspberry sponge cake for my birthday. There isn’t a photo because I forgot to take any. I was all caught up in Bubs’ excitement about blowing out my candles. I assure you it was very pink and very yummy. I’ve also been sewing. I made the robin doorstop that I mentioned in last weeks post. I was in need of a bit of me time and a pick me up yesterday so instead of ironing, or hoovering, or a million and one other chores, I set myself up on the kitchen table with my little blue sewing machine. Isn’t it sweet! The main body is in fabric from last month’s Habdash box and the rest is bits from my stash. Bubs thinks it looks like a chicken not a robin. Who am I to argue. I finally bought a new coat for the school run. I’m picky about coats as I am plus size but not very tall and with short arms. Most clothing companies seem to think that if you’re over a size 16 you’re 6 foot tall and have arms like Inspector Gadget. I’m forever having to roll my coat sleeves up. I finally found the perfect coat in TK Maxx. The sleeves are the right length and it’s warm without being too bulky. One of our dogs, Evie, is due to have puppies any day now so we’re on bump watch. Fingers crossed I’ll have cute puppy photos to share with you next week! 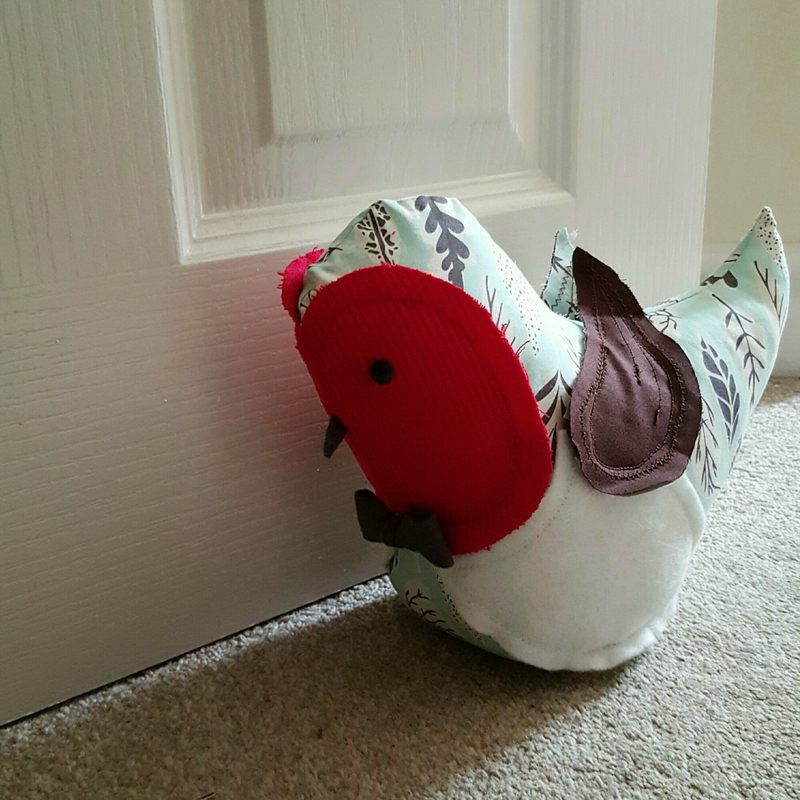 The robin doorstop is too cute! Ah, I imagine it’s so fascinating watching your little one learn to read. My son is coming up 3, so we’re a little way away from that yet, but he is such a bookworm, as am I, and I can’t wait for those days to come. I hope you have a great weekend, and wishing a save delivery for the pups! Thanks! We’ve had the whelping box and all of the puppy paraphernalia delivered today so we’re just waiting on Evie to do her bit. Exciting times! It really is. And I’ve been surprised by how emotional it’s made me too. I know that once she can read any book she wants to she’s going to have so many wonderful adventures and I’m really excited for her. ? Bump watch is almost over and fingers crossed we’ll have puppies by the end of the day. Listening to my girls read is still one of my favourite things to do. It is such a magical moment when they piece it together and start to really get it. Awww I love the Robin door stop it’s super cute. My kids learnt to read with phonics it’s a great way of learning but yes very different to when I learnt to read too. Good look with the puppies I’ll make sure to follow your #littleloves next week to get a sneat peek of them. Fingers crossed X Have a great week.